Novellas have proliferated since romance fiction entered the Digital Age. Not only are hundreds of new novellas available, often linked to popular series, but many beloved older novellas, once available only in anthologies, have been reissued as single titles. I practically danced with delight when one of my top five favorite novellas, The Mad Earl’s Bride, became available in digital format. I first read this novella more than twenty years ago when it was published as part of the anthology Three Weddings and a Kiss. Avon reissued it in 2010 in a different anthology, Three Times a Bride, before making it available as a single title three years later. Both anthologies and the single novella are available for ereaders. Dorian Camoys, Earl of Rawnsley, has been a rebel and a rake hell bent on controlling his life, but at twenty-seven, he becomes convinced that his death from the brain disease that drove his mother into madness before it destroyed her is imminent. Terrified of ending his days restrained like a wild animal, he retreats to his home in Dartmoor. Debilitating headaches and hallucinations are already plaguing Dorian, and he fully expects madness and death to follow. Concerned about the Camoys line ending if Dorian dies without an heir, the duc d’Abonville, a distant relative of Dorian’s, suggests a marriage between Dorian and Gwendolyn Adams, a granddaughter of Genevieve, dowager Viscountess Pembury, the duc’s fiancée. Dorian is initially reluctant, but after a year of self-imposed celibacy, he sees the appeal of marriage to the red-haired witch who evokes both desire and curiosity. Dorian and Gwen get much more from their marriage than they expected, and the reader gets the joy of seeing a passionate, loving relationship develop between two captivating characters. Wonderful dialogue and a fascinating look at early 19th-century medical practices are bonuses, and the gifted Chase moves her readers to laughter and to tears. No matter how many times I read this novella, it is always fresh. 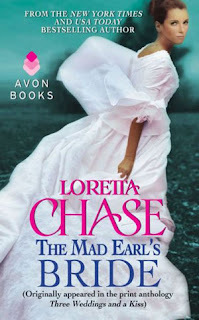 The only thing better than rereading The Mad Earl’s Bride is rereading it as part of a marathon Chase reading that includes Lord of Scoundrels and The Last Hellion. I haven't read this book! Good grief. Now, I'm on a search for it. Me too, Connie! I can't believe there's a Loretta Chase book I managed to miss! I have come to the party late when it comes to Loretta Chase books. This does sound like one I need to find. I love anthologies and have quite a few of them. I will have to dig through them to see if I have 3 Weddings And A Kiss. The title sounds familiar. I will also check for Three Times A Bride. It sounds like a story that will tug at the heart.